Get out to the Eastside Culture crawl this weekend! 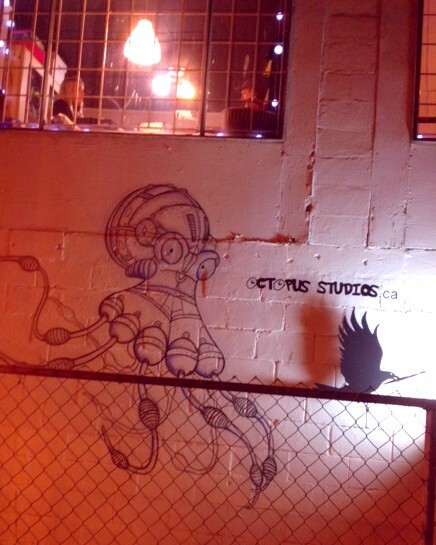 Friday night, we visited Octopus Studios, which is again part of this year’s three-day Eastside Culture Crawl taking place in Vancouver. There are 451 artists showing their work in more than 75 buildings (see map here). 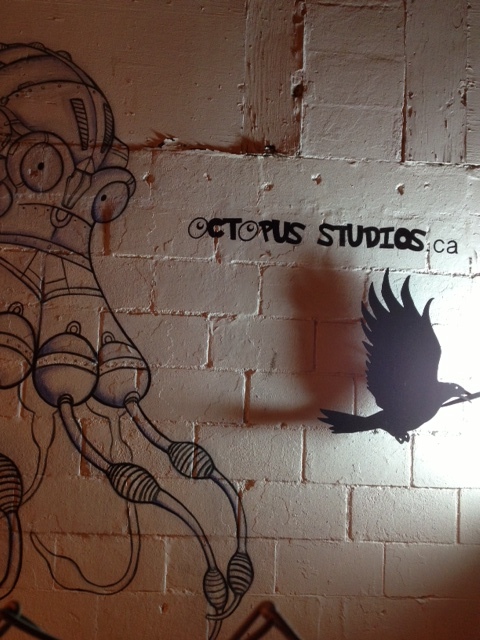 Octopus Studios is located 393 Powell Street, only three blocks from my store, Angel Vancouver. It is on the north side of Powell, almost kitty corner to Oppenheimer Park. The former industrial warehouse building showcases more than a dozen artists. We liked the paintings of Luchia Freman, who lives in the neighbourhood and has done a series of paintings looking out her windows onto the street (one is called Crack Alley and features shadowy figures below, with Luchia’s silhouette at the window; the figure on the left is also her from a photo someone took while she was doing the painting). 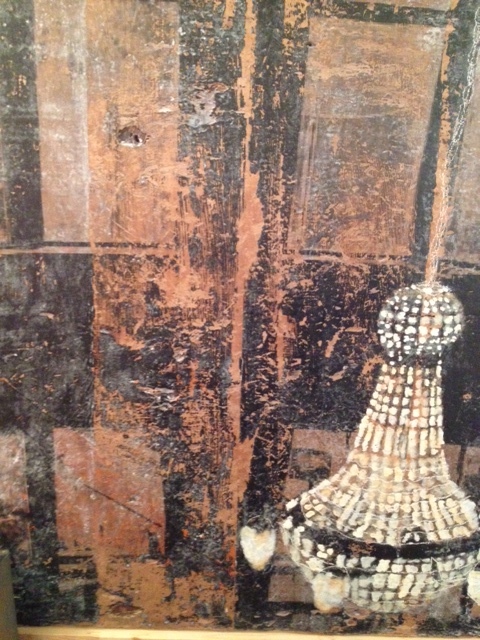 Another has a chandelier painted on a piece of plywood she found on the nearby waterfront, at Crab Park at the foot of Main; the wood is rounded at the edges after being washed against the shore (see photos below – her website: http://www.artforeverybody.com). 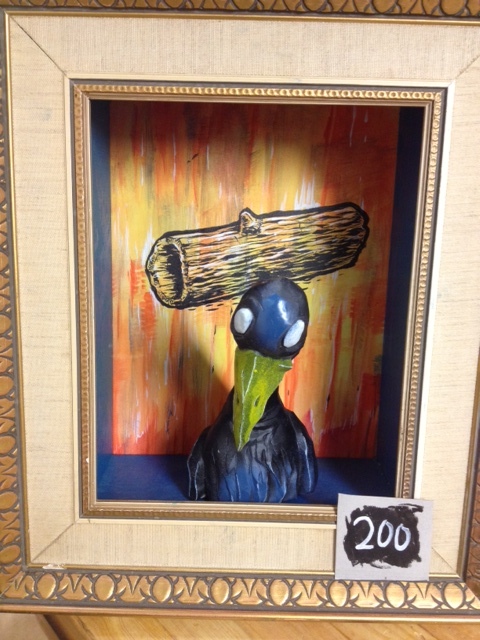 We were also impressed by the bird sculptures that are combined with painting by Sean Karemaker (That’s his drawing at the bottom of this post – he explained he often does his drawings on the bus; he has a blog at seankaremakerblogspot.com). At the very back there’s also a great painting of Pellegrino water bottles done by another artist — I didn’t catch his name. There is also some great jewelry in the building, a soap maker and a person who specializes in underwater portrait photography (some very cool shots of people, fully clothed, taken in pools). More info about Octopus Studios is here. Click on the above Sean Karemaker drawing for a larger image. 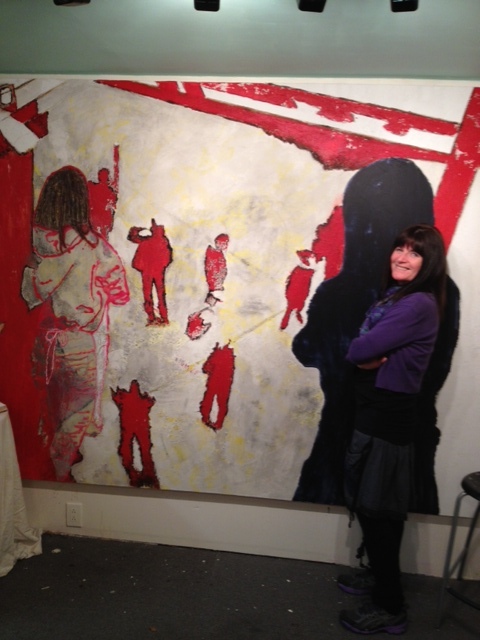 This entry was posted in Uncategorized and tagged Angel Vancouver B.C., Eastside Culture Crawl 2012, Gastown, Octopus Studios Vancouver B.C.. Bookmark the permalink.